I was born at the Vavuniya General Hospital in the winter of 1988, in a town that is often referred to as the gateway to the northern Vanni region. As so many other families before us, we fled Sri Lanka during the civil war, amid death, destruction and uncertainty. We arrived in Scarborough, Canada, in the early 90’s, in what would become the single largest Sri Lankan Tamil diaspora community outside of South Asia. I grew up speaking Tanglish (a blend of Tamil and English), eating string hoppers and spaghetti, and listening to A.R. Rahman and the Backstreet Boys. In short, I am a ‘third culture’ kid, a blend of the home we left behind in Jaffna and the home we worked hard to create in Canada. So as a Canadian medical student when I was presented with the opportunity to spend several weeks training in any field and in any country around the world, the natural choice for me was to go “back home”. Having spent over two decades away, I didn’t quite know what “back home” would mean on this first visit back. After months of phone calls, emails and planning, at the end of June, I arrived at the Jaffna Teaching Hospital, ready to start my five weeks of electives in internal medicine and general surgery. Unsurprisingly, I spent the first few days overwhelmed by the experience. I have been volunteering, working, and learning in hospitals for most of my life. For most, hospitals are places that cause anxiety and stress, but for me, they are often a place of familiarity and comfort, somewhere where I feel engaged and useful. 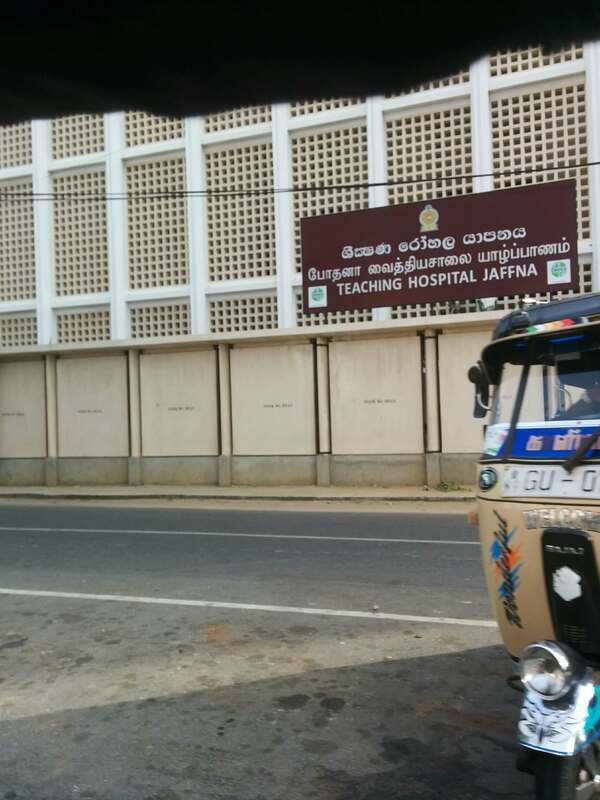 Despite years in this environment, the Jaffna Teaching Hospital felt foreign to me. The wards, the equipment, the staff uniforms, the very rhythm of the place was completely alien. The most obvious difference was that everything was done by hand. There was not a single computer in sight. Having worked in a health system that is increasingly digital, this was a big change for me. I also soon discovered that patient records are not kept locked away in a filing cabinet at the clinic or hospital. Rather, the patients themselves carry their clinic books, lab reports and even MRI scans to each appointment with them. While cumbersome and running the risk of losing documents, this system gives full autonomy to patients over their personal health records and also allows for the mobility of those records from one site to the next. Despite (or perhaps because of) this system, the consultants (in Canada, we call them “attendings”) are able to see a massive case load in a very short period of time. This was most obvious on clinic days where upwards of 40 patients were assessed, treated, and dismissed and/or given a date for follow up, all within the span of two to three hours. It’s a whirlwind of papers shuffling, names being called, patients shifting in and out of the examination rooms, and notes hurriedly scrawled into clinic books. I was equally stunned the first time I stepped into the casualty theatre – a carryover, it seemed, from Sri Lanka’s civil war, when trauma patients would flood into the hospital every day. Two tables, with one anesthetist each, for procedures that require general anesthesia. All other procedures were conducted under local anesthesia on stretchers flying in and out of the large operating theatre. And, at the centre of it all, a group of dedicated and talented registrars and surgeons operate on everything from in-grown toenails causing infection to inguinal hernias, all using proper aseptic and clean protocols. As a student, it was incredible to move from one table to the next and see so many different techniques and procedures happening simultaneously. To me, this was controlled chaos. And this phrase echoed through my mind again and again as I proceeded through my weeks of training in Jaffna. But beyond the differences, the language of medicine remained a constant thread to which I could hold. Human anatomy is the same the world over. And I marvelled as I watched my general surgery preceptor carefully reveal the facial nerves of a patient with a suspected tumour over his jaw bone. Like the branches of a tree, the branches of cranial nerve seven spread out across one half of the patient’s face, beginning to divide and separate just in front of the ear. It was like I was looking at a diagram in a textbook, the dissection down to the tumour was so precise and clean. Acetaminophen too is the same all over the world. Whether we call it Panadol, Paracetamol or Tylenol, all three can be used to bring down a fever, all three can be used to relieve pain. Though the medicine was fascinating, the most enriching aspects of this journey to Jaffna were the people that I had the privilege of meeting. From the patients, nursing staff, and fellow medical students to the registrars and consultants who served as my teachers and mentors, the people I met throughout my five weeks at the Jaffna Teaching Hospital made the experience unforgettable. They worked to bridge the cultural and linguistic gaps between us, provided thoughtful and insightful answers to my questions, and facilitated opportunities to practice clinical skills and learn new techniques. What do you do, for example, with a patient with diabetic foot ulcers who can’t afford to buy shoes? Or having to label an otherwise medically fit patient as a “poor candidate” for kidney transplant because all such surgeries are done in the private sector and require hundreds of thousands of rupees to carry out? I feel honoured to have had the opportunity to be a learner in Jaffna, and to speak to patients and practise medicine in my mother tongue, Tamil. I feel especially privileged to have met the dedicated, passionate, and talented physicians and medical students who propel medicine forward in Jaffna. Despite systemic barriers, low resources and a significantly complex patient population, they persevere, they innovate and they thrive. As a teacher and friend from my general surgery elective in Jaffna so poignantly stated, “We have the resilience gene”. And I could not agree with him more. Gayathri Naganathan is a second year medical student at McMaster University in Ontario, Canada. She is a daughter of the Tamil diaspora and a proud “third culture” kid.